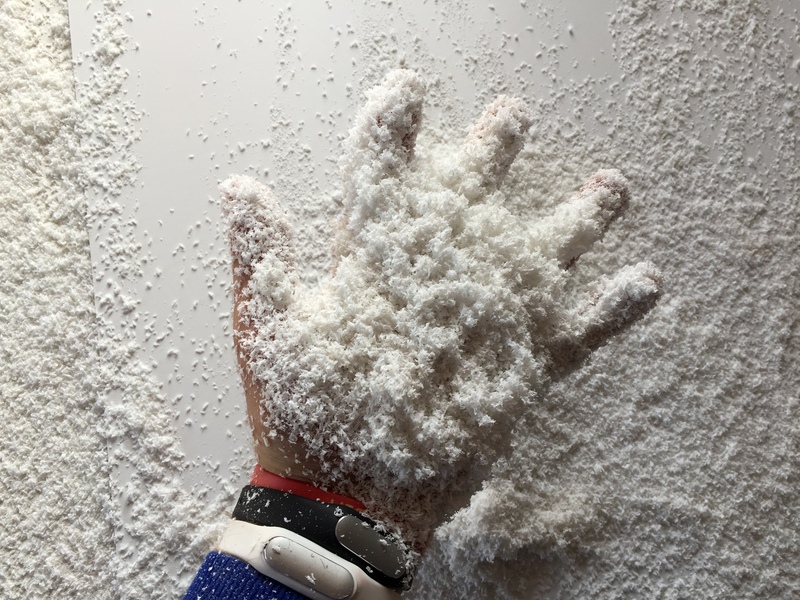 Hello Habr! In last article I mentioned that in the environment of children's circles of technical creativity it is quite difficult to find kits for the comprehensive study of children of all kinds of disciplines. Today I will tell you about how we came up with children's robotics kits. 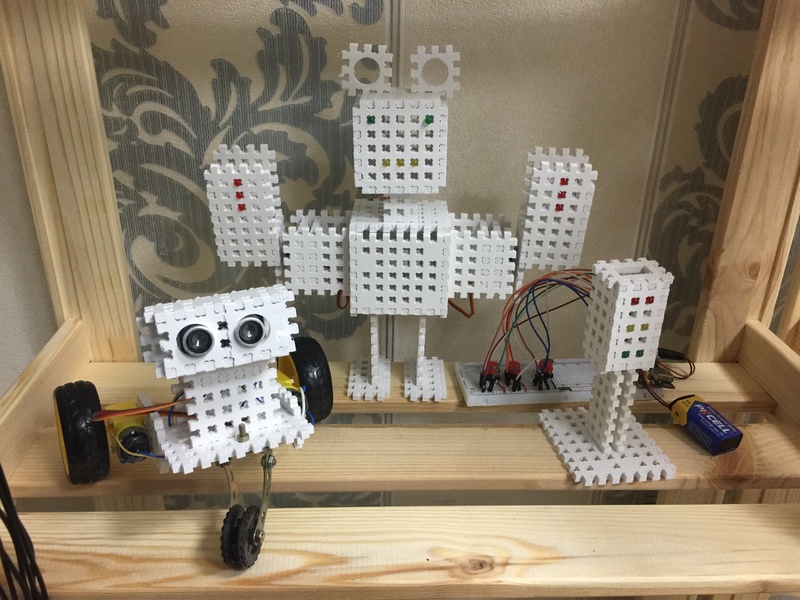 In the first month of the work of the robotics center, in addition to the rapid writing of various training programs, we had to invent various devices for these programs. If a child is to say: "Look, this is a resistor, and this is a light-emitting diode", then it will be of little use. Children have always been more interested in making full-fledged projects that they had previously met in real life or could have applied them there. The first tool that we decided to apply was a structuring tool. Amperkovskie price lists did not please us, to put it mildly, and we decided to produce the structure on our own, there was a production base with several CNC machines. For those who do not know, the structur is a completely open development. That is, anyone can download drawings from the Internet, cut himself a structural bag and do with it whatever he wants. Looking at the pictures of the finished parts, it seemed to us that it was easier to produce a structure than to cut a wooden block with a hand saw. But everything turned out to be a bit more complicated. The biggest difficulty was choosing the cutting mode, that is, the feed and rotational speed, and also the optimum view of the cutter. Through a dozen broken mills and not one dozen defective parts, we still managed to cut out the ideal piece of the structure. We immediately made a pair of structural boxes and carried them to the center of robotics. Structor liked the percentage of 90 children. The others did not understand him. He seemed too simple to them. A feature of the structure is the displacement of the part by 5 mm after insertion into another part. Therefore, the structure is actually more complex than it seems. When the children, who seemed incredibly simple to the constructor, took it in their hands, began to build something, and they did not succeed, the first reaction was the phrase: "Your structure is a complete garbage, and I do not want to collect it." But such children were not enough, so we considered testing the structure as successful. However, it is good to make different cases and boxes from the structure, and on this his dignity ended. 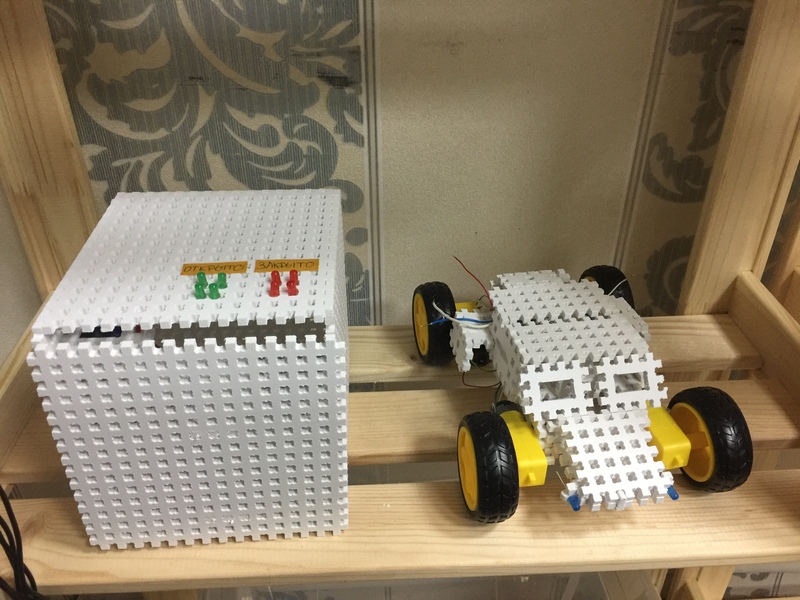 A full-fledged robot from a structure would lose to a robot from the same Lego or Soviet designer. To build a robot in it too monotonous parts. But we found a way out of this problem. It was obvious that it is convenient to collect rectangular elements from the structure, the rest of the designers can not boast of this. Therefore, we decided to make a huge detail of the structure for modeling a city of 2x1 meters in size. Such sheet can be put on desks, and children directly on it collect houses, which then can be united in a city. This approach was very pleasing to children. Those who did not understand the structure at the very beginning, now gladly gathered various structures from it. Children from him was simply not to delay. 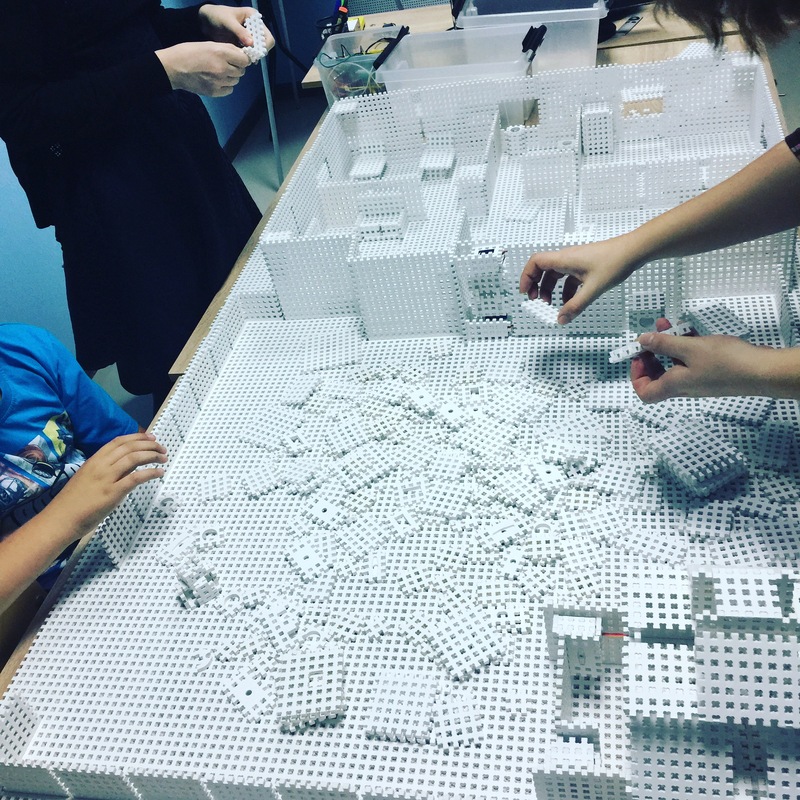 The plan for the lesson with the construction of the city was as follows: half the class, the children gather the city from the structure, and all buildings must be thematic: school, hospital, zoo, military base, etc. 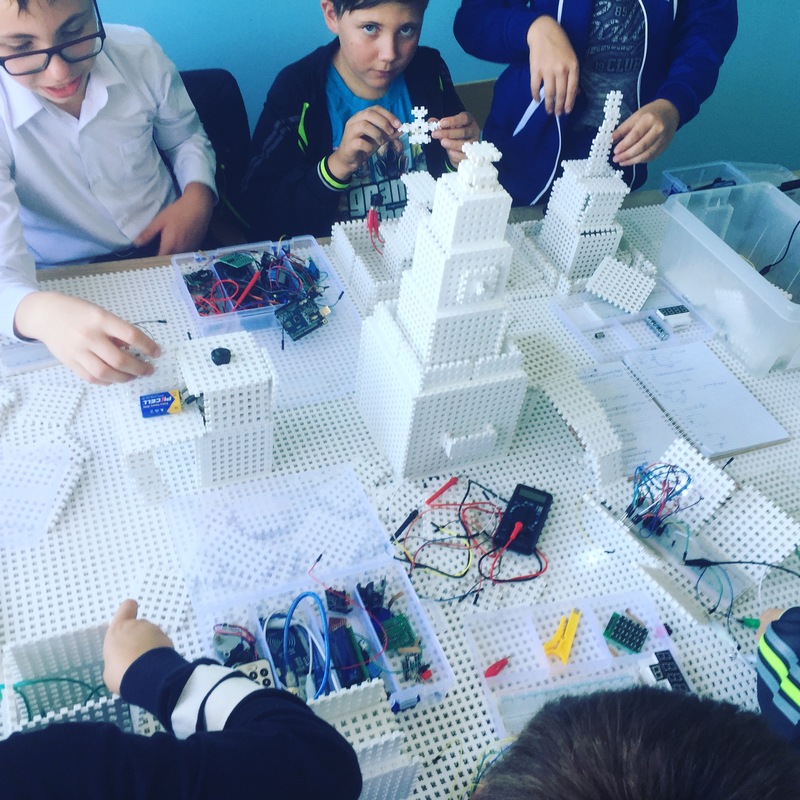 The rest of the class, the children have all kinds of electronics in the city: they pull the wires from the power station (the battery pack) into each house, conduct street lighting, make calls and so on. Everyone wanted to use as complex a scheme as possible in his home, so the children listened to the theory more attentively and learned the material better. After a couple of months, we finally wrote the curriculum for a few months ahead, and we had free time. 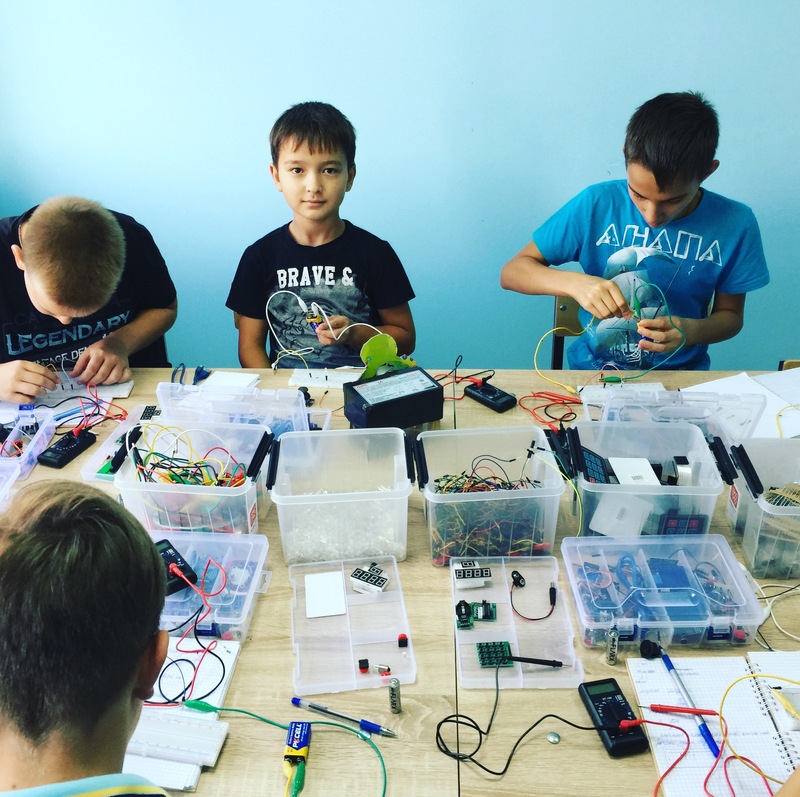 We decided to spend it on development of robotics kits for children's centers of technical creativity. At the very beginning of the establishment of our robotics centers, we seriously considered buying a franchise of some famous networker. For the second time, the prices surprised us. Network mugs for the franchise have requested from 0.5 to 1.5 million rubles. At the same time, all that they offered for this money: help in choosing a place, opening a jur. persons, access to the curriculum and small land. 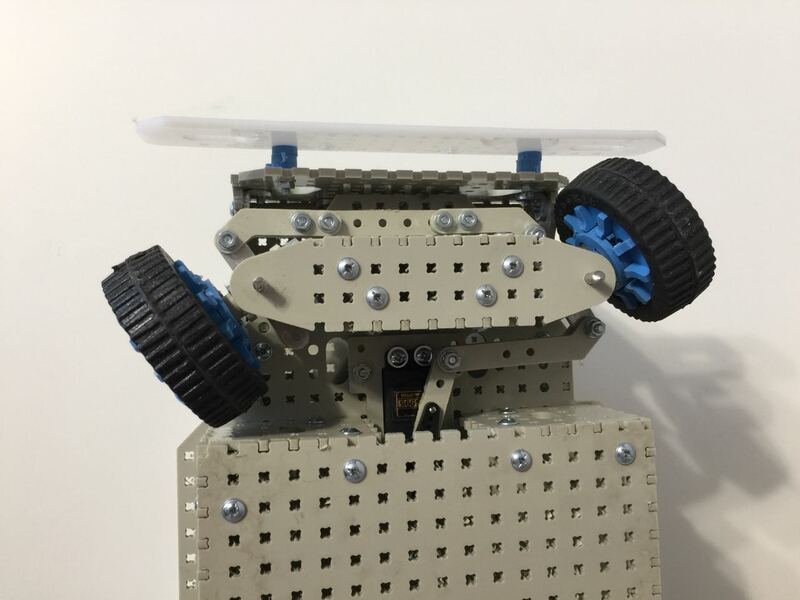 Robotics kits need to be bought separately. The lion's share of the cost of the franchise was in the brand of the mug. However, in small towns, almost no one heard of the famous networks of robotics in Moscow or regional centers. Yes, and all the mugs worked on lego, which did not please us. Lego-robotics at the time (in principle, as now) we disliked. A year has passed since the launch of our first circle, we gained experience and opened another 4 mugs of robotics. Each subsequent Center was even more exciting to launch than the previous one, while the more recent ones showed the best result. Recently we started packing franchise and faced with a lot of pitfalls and interesting solutions. In the near future we will publish our experience on packing the franchise on the habra, because there was not any detailed guidance on this topic on the Internet. Analysis of the existing franchises was the first beacon to making everything itself normal. Ideal - you buy a franchise for about 500 thousand rubles. This price includes: sets of robotics and electronics, computers, a ton of designer for design, curriculum, furniture and small household appliances (TV, water cooler, etc. ), help with the choice of location and registration of the legal entity, help with advertising and support at start-up . When we were looking for a franchise (mid-2017), the market was not that close. We assembled a team of developers in one of the centers of robotics, tightly closed, typing in advance a meal for a couple of days, and began to come up with sets. The first set of robotics was planned to be assembled on the basis of the structure. In dreams it was a huge beautiful box, in which there was a mountain of structure and electronics, and a huge book, in which hundreds of various devices and experiments were painted. After the initial evaluation of the planned work and competitors in our team there was a split. Half believed that the set we will develop and it will be quite interesting. The other half said that the structure is not suitable for such a set. After a day of work, we still had models of various devices ready. It should be said that there were very interesting projects there. For example, an automated chandelier that was switched on by itself or by the degree of illumination, a safe with a combination lock, a robot that can drive along the line, a cell phone model and much more. However, when the lion's part of the work was already done, the main programmer came up with an interesting idea. 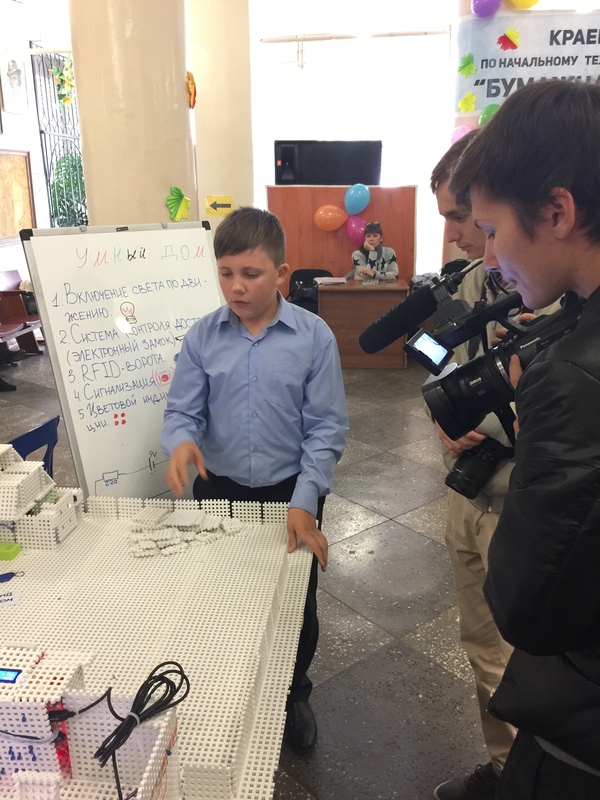 A few months after the opening of the first center of robotics, we drove a few children to the regional competitions with a huge model of a smart house, made on the same sheet for designing 2х1 m. We prepared thoroughly for the competitions, took a little bit of merchandise, flipchart, all dressed more decently. Nataskali children at the presentation. They addressed each other by name and patronymic. In general, at the contest, we won at the moment, as soon as we entered the room in which it was held. A smart house on the basis of a structure is made quite interesting, because it has all the necessary details for it! Electronics for the model of a smart house was always complete, but for some reason nobody designed any designer. We decided to look for sets of smart home. The idea to combine electronics with the structure seemed so simple that we did not believe that no one had done this yet. Yes, even the same Amperka. You will be surprised, but this really was not. We immediately sketched out an approximate project plan, the model of the house was assembled from the available structure, all the electronics were uncoiled in their places. 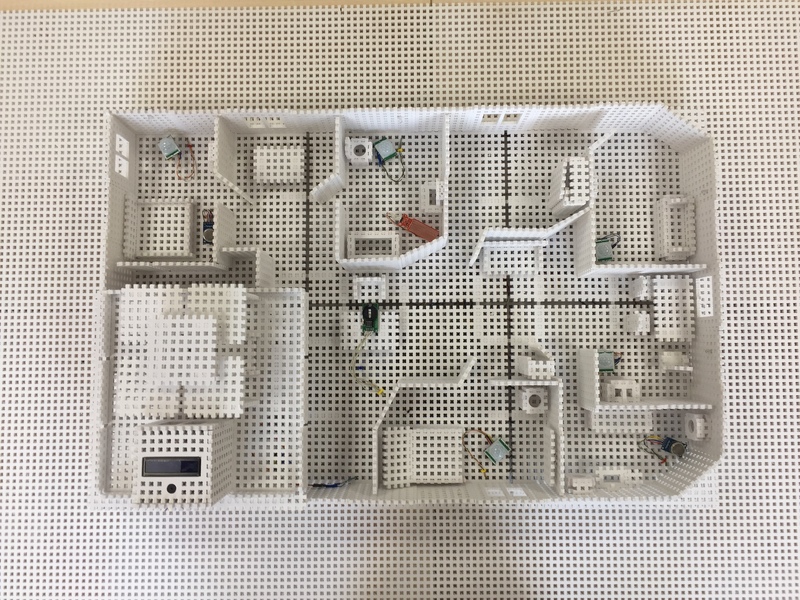 After the creation of the first, rough model of a smart house from the structure, we realized that making a set based on it was a really cool idea! The countdown went, and we began to design our first set of children's robotics. 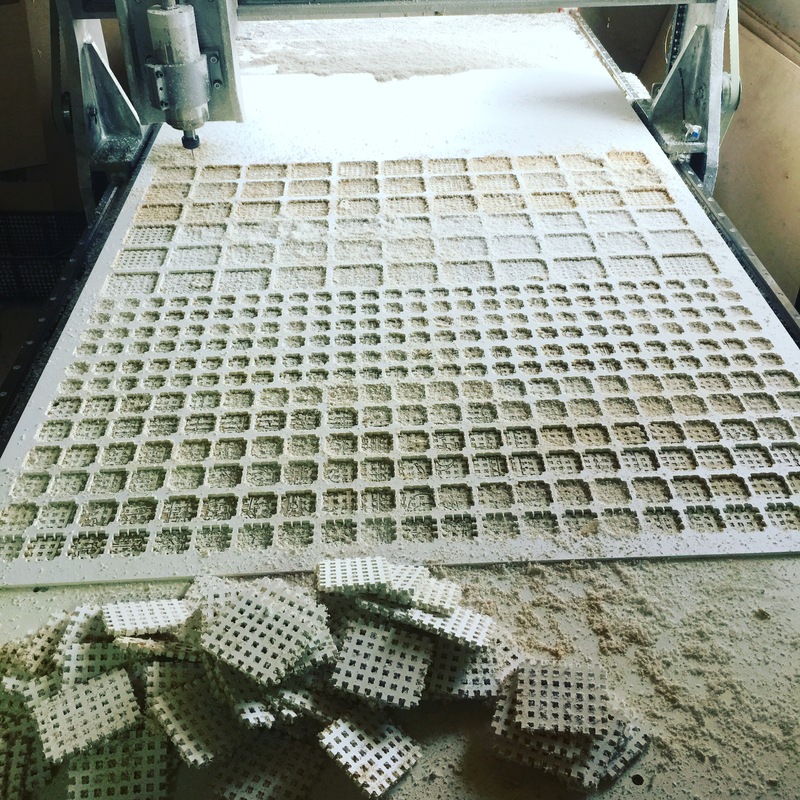 A lot of processes were developed in parallel and worked day and night. Boxes for our set we were going to order from the guys who make the packaging almost for the entire Krasnodar region. However, the minimum order amount for the boxes of interest was 300 thousand rubles. This amount itself is not that big on the scale of the whole development, but if we calculate how many sets we need to staff in these boxes, then it turns out a bit too much. A small number of boxes in Russia, few people do, and if it does, it is unreasonably expensive. The decision was under our noses. 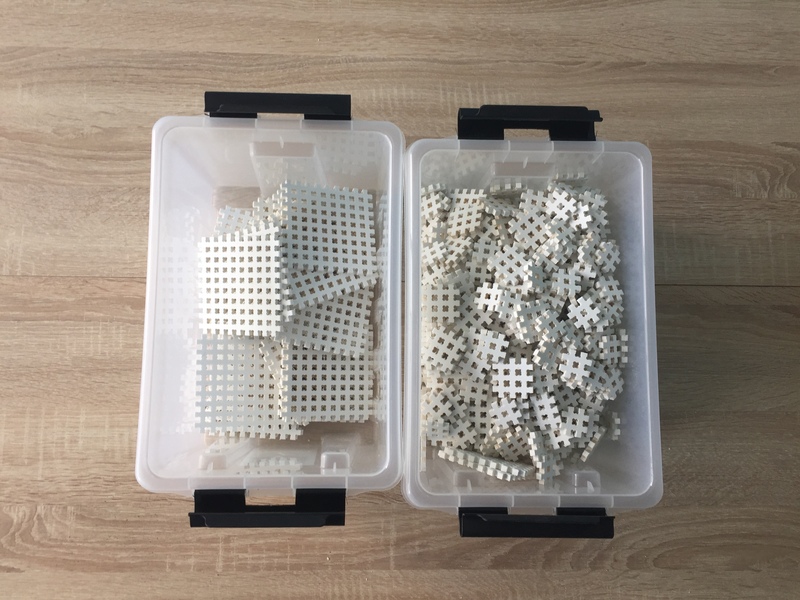 Foamed PVC plastic, from which we made the structure, is also great for making boxes. As a result, we modeled the boxes for the collection of a smart house from the structor in the form factor of the structure. It turned out very well. A little more than a month later the first prototype set was ready. The curriculum for the kit at that time was written in half, but it is the most difficult part of the development kit. The first set tests in the field showed that we did something very cool. In the middle of the development, it dawned on us that we could also make a younger version of a smart home - a smart room. Most of the set of smart rooms was taken from a smart home, so we received two sets for children's technical creativity in the shortest possible time! 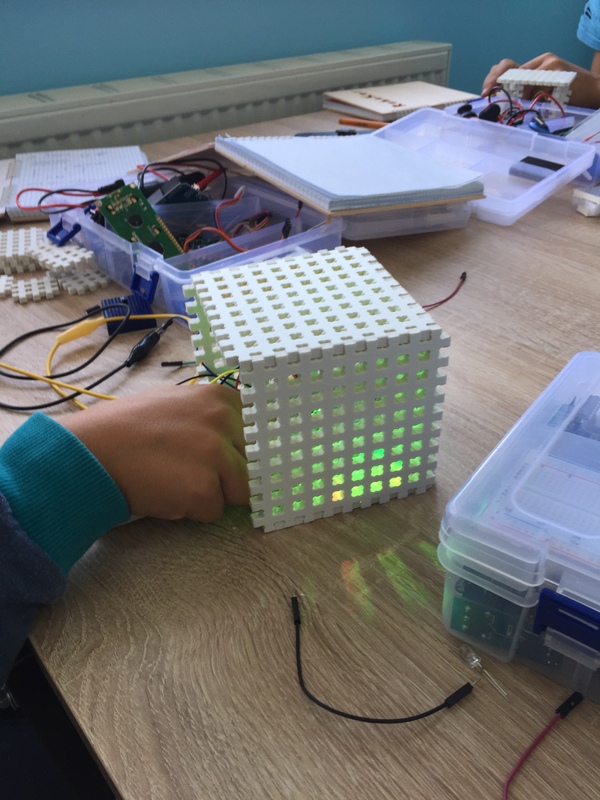 The set of a smart house is going in several stages: first of all you design a model of your own home from a whole mountain of a structure, then you have all the necessary electronics in the model, according to the book, then transfer the electronics to your real house. 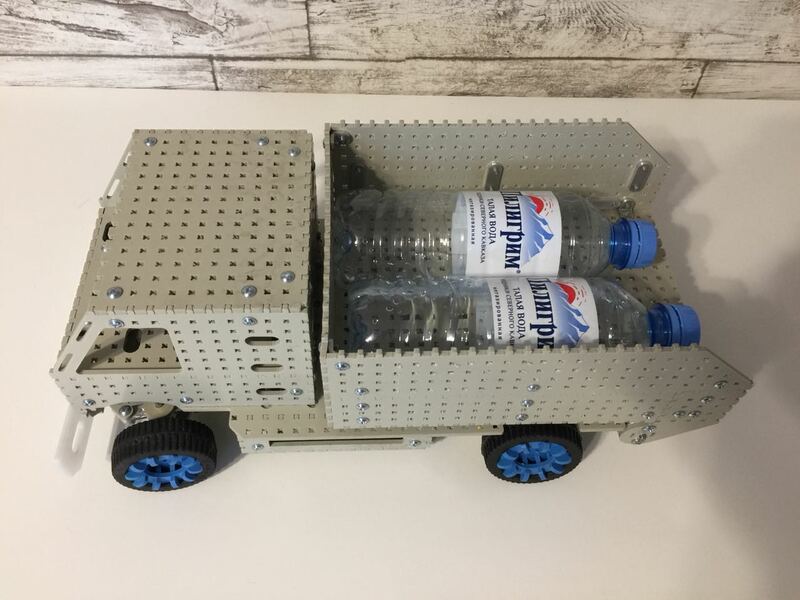 In the centers of robotics our kits were liked by all children without exception. Absolutely everything was included in the assembly, even the teachers. When new children come to us to register and see the entire process of developing a smart home, they almost always ask to stay at once for a lesson and at least observe what is happening. Unfortunately, after completing the work for 60%, the development of the smart home set has gone down a bit. Now we are completely ready to pack. The instructions are worse. In parallel to the structure, we worked out the technical process for creating the multiplayer designer, which is also an open development. It was much harder to produce than a structured one, but in the end we learned how to cut quality parts. 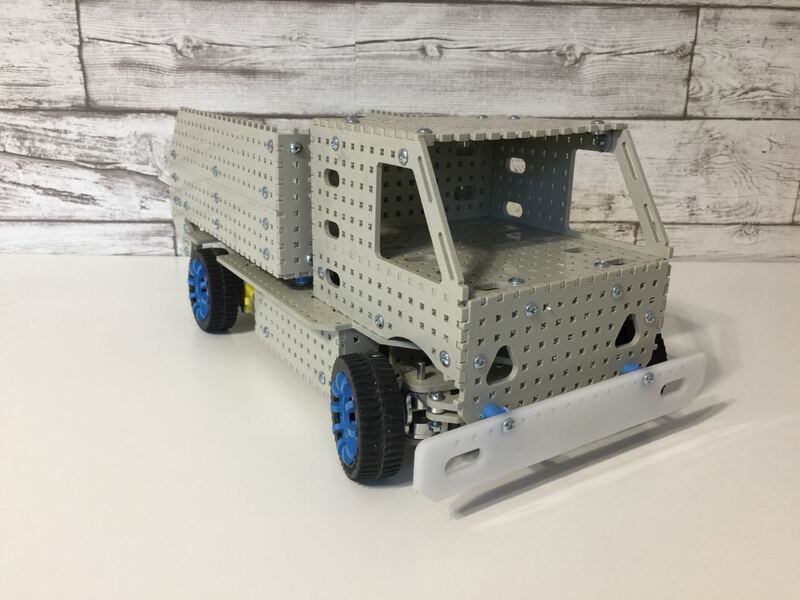 The result of developing the kit on the basis of the multiplayer was a very interesting truck. Its dimensions slightly exceeded the standard models of cars. The payload was impressive. Also, the front wheels were turned in a very interesting way. The body operates a separate servo. By the way, we also manufactured all aluminum parts and tires ourselves. When developing a truck, we again suffered a disease of 60 percent. The truck itself is completely ready, but there are no packages and instructions for it. In general, as you already understood, everything is bad with the instructions. At the moment, the projects were removed in a long box, or put on the shelf as an exhibition model with the hope that one day it will be possible to return to the development. 10/08/2018 Charitable action "Give children wings"